Arco-Íris (Leiria, Portugal) on 17 August 2009 in Transportation and Portfolio. Estação de São Bento Construída no local de um antigo convento, foi completada em 1916. Actualmente, destina-se apenas a comboios regionais. No interior, os imensos painéis de azulejos de Jorge Colaço, representando cenas históricas, conferem-lhe uma rara beleza artística. Wonderful tones and light!! Nice work! the composition and B&W application just made this uber-awesome! Beautiful light and grey tones. This composition is fantastic. Great composition, love the light and graphism. Excellent choice for b&w! Great details and composition, nice one! beautiful B&W for this urban view ! Great! 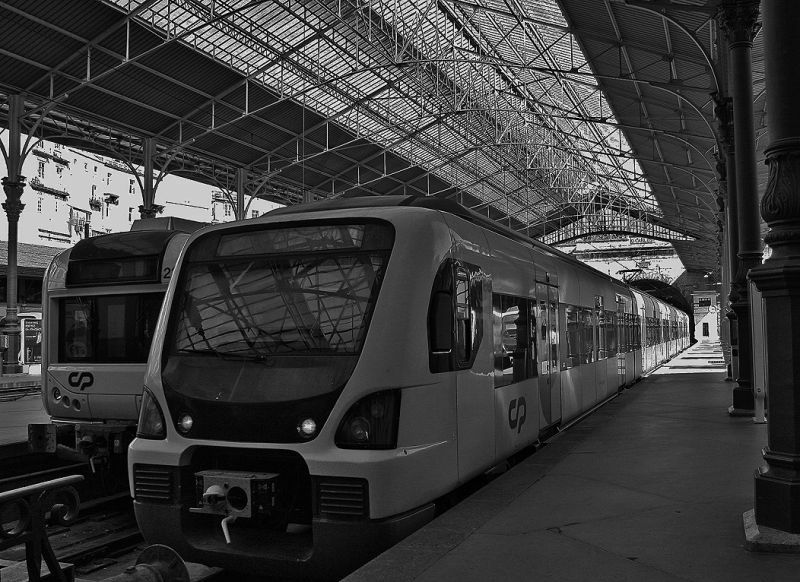 I love trains, BW & urban look. Wonderful photo, Ana! Great lines! I like trains! Très beau cadrage et superbe lumière, magnifique photo! Une très belle atmosphère de départ dans cette belle gare! Molt bonica la perspectiva. Una gamma de grisos excel·lent!!!! SALUT!!! Mas este comboio regional é muito giro. Muito bem enquadrado. une bonne idée de mettre ca en noir et blanc ! This is quite the beautiful station. Great looking trains too. I wish we had decent rail transport in this country. I like your well crafted B&W image a lot. Uma estranha e interessante atmosfera .. Eu realmente gostei da falta de pessoas ! This a a crystal clear B&W that really gives us the ambiance of "train station" so well. I enjoy the perspective and the distant patch of sunlight. Beautifully taken! beautiful black and white, and great composition, the train really draws your eye through the picture. Tamos sempre a aprender, n sabia de nada disso. Parabéns pelas boas fotos.